The Roman Catholic Church teaches that in the Eucharistic offering bread and wine are changed into the body and blood of Christ. The reaffirmation of this doctrine was expressed, using the word "transubstantiate", by the Fourth Council of the Lateran in 1215. It was later challenged by various 14th-century reformers, John Wycliffe in particular. The manner in which the change occurs, the Roman Catholic Church teaches, is a mystery: "The signs of bread and wine become, in a way surpassing understanding, the Body and Blood of Christ. ":1333 The precise terminology to be used to refer to the nature of the Eucharist and its theological implications has a contentious history, especially in the Protestant Reformation. In the Greek Orthodox Church, the doctrine has been discussed under the term of metousiosis, coined as a direct loan-translation of transsubstantiatio in the 17th century. In Eastern Orthodoxy in general, the Sacred Mystery (Sacrament) of the Eucharist is more commonly discussed using alternative terms such as "trans-elementation" (μεταστοιχείωσις, metastoicheiosis), "re-ordination" (μεταρρύθμισις, metarrhythmisis), or simply "change" (μεταβολή, metabole). The belief that the bread and wine that form the matter of the Eucharist become the body and blood of Christ appears to have been widespread from an early date, with early Christian writers referring to them as his body and the blood. They speak of them as the same flesh and blood which suffered and died on the cross. The short document known as the Teaching of the Apostles or Didache, which may be the earliest Christian document outside of the New Testament to speak of the Eucharist, says, "Let no one eat or drink of your Eucharist, unless they have been baptized into the name of the Lord; for concerning this also the Lord has said, 'Give not that which is holy to the dogs'." 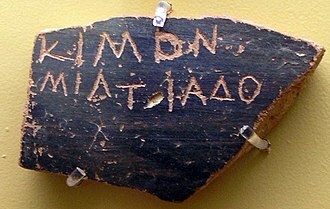 A letter by Ignatius of Antioch to the Romans, written in about AD 106 says: "I desire the bread of God, the heavenly bread, the bread of life, which is the flesh of Jesus Christ, the Son of God, who became afterwards of the seed of David and Abraham; and I desire the drink of God, namely His blood, which is incorruptible love and eternal life." Writing to the Christians of Smyrna in the same year, he warned them to "stand aloof from such heretics", because, among other reasons, "they abstain from the Eucharist and from prayer, because they confess not the Eucharist to be the flesh of our Saviour Jesus Christ, which suffered for our sins, and which the Father, of His goodness, raised up again." In about 150, Justin Martyr, referring to the Eucharist, wrote: "Not as common bread and common drink do we receive these; but in like manner as Jesus Christ our Savior, having been made flesh by the Word of God, had both flesh and blood for our salvation, so likewise have we been taught that the food which is blessed by the prayer of His word, and from which our blood and flesh by transmutation are nourished, is the flesh and blood of that Jesus who was made flesh." In about AD 200, Tertullian wrote: "Having taken the bread and given it to His disciples, He made it His own body, by saying, This is my body, that is, the figure of my body. A figure, however, there could not have been, unless there were first a veritable body. An empty thing, or phantom, is incapable of a figure. If, however, (as Marcion might say) He pretended the bread was His body, because He lacked the truth of bodily substance, it follows that He must have given bread for us." The Apostolic Constitutions (compiled c. 380) says: "Let the bishop give the oblation, saying, The body of Christ; and let him that receiveth say, Amen. And let the deacon take the cup; and when he gives it, say, The blood of Christ, the cup of life; and let him that drinketh say, Amen." Perhaps you will say, "I see something else, how is it that you assert that I receive the Body of Christ?" ... Let us prove that this is not what nature made, but what the blessing consecrated, and the power of blessing is greater than that of nature, because by blessing nature itself is changed. ... For that sacrament which you receive is made what it is by the word of Christ. But if the word of Elijah had such power as to bring down fire from heaven, shall not the word of Christ have power to change the nature of the elements? ... Why do you seek the order of nature in the Body of Christ, seeing that the Lord Jesus Himself was born of a Virgin, not according to nature? It is the true Flesh of Christ which was crucified and buried, this is then truly the Sacrament of His Body. The Lord Jesus Himself proclaims: "This Is My Body." Before the blessing of the heavenly words another nature is spoken of, after the consecration the Body is signified. He Himself speaks of His Blood. Before the consecration it has another name, after it is called Blood. And you say, Amen, that is, It is true. Let the heart within confess what the mouth utters, let the soul feel what the voice speaks. Other fourth-century Christian writers say that in the Eucharist there occurs a "change", "transelementation", "transformation", "transposing", "alteration" of the bread into the body of Christ. In AD 400, Augustine quotes Cyprian (AD 200): "For as Christ says 'I am the true vine,' it follows that the blood of Christ is wine, not water; and the cup cannot appear to contain His blood by which we are redeemed and quickened, if the wine be absent; for by the wine is the blood of Christ typified, ..."
Roman Catholic historian and journalist Garry Wills, who is opposed to many Catholic teachings, believes on the contrary that during the patristic period the Eucharist ("Thanksgiving") was simply a celebration of the people's oneness at the "one altar", suggesting that such a meaning of the "body of Christ" would "persist as late as the fourth and fifth centuries, in Augustine's denial of the real presence of Jesus in the elements of the meal." Wills says that for Augustine "that what is changed in the Mass is not the bread given out but the believers receiving it", in support of which he cites Augustine's Sermon 227 in a translation that has him say: "What you see passes away, but what is invisibly symbolized does not pass away. It perdures. The visible is received, eaten, and digested. But can the body of Christ be digested? Can the church of Christ be digested? Can Christ's limbs be digested? Of course not." The passage concerns not the physical body of Christ, but what has been called the mystical body of Christ, the body of Christ that is the Church. However, Wills uses an inaccurate translation. Augustine asks: "Is (the original Latin text has no verb corresponding to "can" at this point) the body of Christ consumed? (in the original Latin, consumitur, not "digested".) Is the Church of Christ consumed? Are the members (in the original Latin membra, not "limbs") of Christ consumed?" Wills further claims that Augustine's "thought does not linger on the real presence of Christ in the eucharistic elements, but passes straight to the ultimate meaning of the eucharist, the ultimate grace signified by Christ's body and blood in the sacrament, namely the unity of the body of Christ which is the Church, and our living incorporation into it. He doesn't deny the real presence, as was later thought by, for example, some of the Protestant reformers. But he knows that it is only, so to say, the middle stage of the sacrament, what Saint Thomas Aquinas calls the res et sacramentum, the thing signified by the visible celebration, which is itself also the sacrament, that is the sign, of a further thing. It is this further thing, what Saint Thomas calls the res tantum, the ultimate thing or grace signified, that always interests Augustine. And the grace of the eucharist is the unity of the body of Christ and our participation in it. The real presence of Christ under the appearances of bread and wine has the same place in this sacrament as the baptismal character has in baptism: a kind of half-way stage, or middle level, in the sacramental mystery of grace." The doctrine of transubstantiation is the result of a theological dispute started in the 11th century, when Berengar of Tours denied that any material change in the elements was needed to explain the Eucharistic Presence, thereby provoking a considerable stir. Berengar's position was never diametrically opposed to that of his critics, and he was probably never excommunicated, but the controversies that he aroused (see Stercoranism) forced people to clarify the doctrine of the Eucharist. The earliest known use of the term "transubstantiation" to describe the change from bread and wine to body and blood of Christ in the Eucharist was by Hildebert de Lavardin, Archbishop of Tours, in the 11th century. By the end of the 12th century the term was in widespread use. During the Protestant Reformation, the doctrine of transubstantiation was heavily criticised as an Aristotelian "pseudophilosophy" imported into Christian teaching and jettisoned in favor of Martin Luther's doctrine of sacramental union, or in favor, per Huldrych Zwingli, of the Eucharist as memorial. Therefore, it is an absurd and unheard-of juggling with words, to understand "bread" to mean "the form, or accidents of bread", and "wine" to mean "the form, or accidents of wine". Why do they not also understand all other things to mean their forms, or accidents? Even if this might be done with all other things, it would yet not be right thus to emasculate the words of God and arbitrarily to empty them of their meaning. Moreover, the Church had the true faith for more than twelve hundred years, during which time the holy Fathers never once mentioned this transubstantiation – certainly, a monstrous word for a monstrous idea – until the pseudo-philosophy of Aristotle became rampant in the Church these last three hundred years. During these centuries many other things have been wrongly defined, for example, that the Divine essence neither is begotten nor begets, that the soul is the substantial form of the human body, and the like assertions, which are made without reason or sense, as the Cardinal of Cambray himself admits. Why then should we not much more say in the Supper, "This is my body", even though bread and body are two distinct substances, and the word "this" indicates the bread? Here, too, out of two kinds of objects a union has taken place, which I shall call a "sacramental union", because Christ's body and the bread are given to us as a sacrament. This is not a natural or personal union, as is the case with God and Christ. It is also perhaps a different union from that which the dove has with the Holy Spirit, and the flame with the angel, but it is also assuredly a sacramental union. What Luther thus called a "sacramental union" is often erroneously called consubstantiation by non-Lutherans. In "On the Babylonian Captivity", Luther upheld belief in the Real Presence of Jesus and, in his 1523 treatise The Adoration of the Sacrament, defended adoration of the body and blood of Christ in the Eucharist. Huldrych Zwingli taught that the sacrament is purely symbolic and memorial in character, arguing that this was the meaning of Jesus' instruction: "Do this in remembrance of me." King Henry VIII of England, though breaking with the Pope, kept many essentials of Catholic doctrine, including transubstantiation. This was enshrined in the Six Articles of 1539, and the death penalty specifically prescribed for any who denied transubstantiation. This was changed under Elizabeth I. In the 39 articles of 1563, the Church of England declared: "Transubstantiation (or the change of the substance of Bread and Wine) in the Supper of the Lord, cannot be proved by holy Writ; but is repugnant to the plain words of Scripture, overthroweth the nature of a Sacrament, and hath given occasion to many superstitions". and made Mass illegal. For a century and half – 1672 to 1828 – transubstantiation had an important role, in a negative way, in British political and social life. Under the Test Act, the holding of any public office was made conditional upon explicitly adjuring Transubstantiation. Any aspirant to public office had to repeat the formula set out by the law: "I, N, do declare that I do believe that there is not any transubstantiation in the sacrament of the Lord's Supper, or in the elements of the bread and wine, at or after the consecration thereof by any person whatsoever." In 1551, the Council of Trent confirmed the doctrine of transubstantiation as Catholic dogma, stating that "by the consecration of the bread and wine there takes place a change of the whole substance of the bread into the substance of the body of Christ our Lord and of the whole substance of the wine into the substance of his blood. This change the holy Catholic Church has fittingly and properly called transubstantiation." In its 13th session ending 11 October 1551, the Council defined transubstantiation as "that wonderful and singular conversion of the whole substance of the bread into the Body, and of the whole substance of the wine into the Blood – the species only of the bread and wine remaining – which conversion indeed the Catholic Church most aptly calls Transubstantiation". This council officially approved use of the term "transubstantiation" to express the Catholic Church's teaching on the subject of the conversion of the bread and wine into the body and blood of Christ in the Eucharist, with the aim of safeguarding Christ's presence as a literal truth, while emphasizing the fact that there is no change in the empirical appearances of the bread and wine. It did not however impose the Aristotelian theory of substance and accidents: it spoke only of the species (the appearances), not the philosophical term "accidents", and the word "substance" was in ecclesiastical use for many centuries before Aristotelian philosophy was adopted in the West, as shown for instance by its use in the Nicene Creed which speaks of Christ having the same "οὐσία" (Greek) or "substantia" (Latin) as the Father. The Disputation of the Holy Sacrament (Raphael 1509-1510) depicts theologians debating Transubstantiation, including four Doctors of the Church, with Pope Gregory I and Jerome seated to the left of the altar and Augustine and Ambrose to the right, Pope Julius II, Pope Sixtus IV, Savonarola and Dante Alighieri. While the Catholic doctrine of transubstantiation in relation to the Eucharist can be viewed in terms of the Aristotelian distinction between substance and accident, Catholic theologians generally hold that, "in referring to the Eucharist, the Church does not use the terms substance and accident in their philosophical contexts but in the common and ordinary sense in which they were first used many centuries ago. The dogma of transubstantiation does not embrace any philosophical theory in particular." This ambiguity is recognized also by a Lutheran theologian such as Jaroslav Pelikan, who, while himself interpreting the terms as Aristotelian, states that "the application of the term 'substance' to the discussion of the Eucharistic presence antedates the rediscovery of Aristotle. [...] Even 'transubstantiation' was used during the twelfth century in a nontechnical sense. Such evidence lends credence to the argument that the doctrine of transubstantiation, as codified by the decrees of the Fourth Lateran and Tridentine councils, did not canonize Aristotelian philosophy as indispensable to Christian doctrine. But whether it did so or not in principle, it has certainly done so in effect". The view that the distinction is independent of any philosophical theory has been expressed as follows: "The distinction between substance and accidents is real, not just imaginary. In the case of the person, the distinction between the person and his or her accidental features is after all real. Therefore, even though the notion of substance and accidents originated from Aristotelian philosophy, the distinction between substance and accidents is also independent of philosophical and scientific development." "Substance" here means what something is in itself: A hat's shape is not the hat itself, nor is its colour, size, softness to the touch, nor anything else about it perceptible to the senses. The hat itself (the "substance") has the shape, the color, the size, the softness and the other appearances, but is distinct from them. While the appearances are perceptible to the senses, the substance is not. 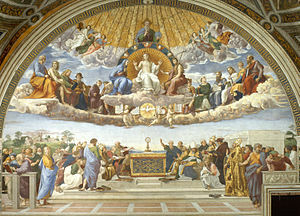 The Council of Trent summarizes the Catholic faith by declaring: "Because Christ our Redeemer said that it was truly his body that he was offering under the species of bread, it has always been the conviction of the Church of God, and this holy Council now declares again, that by the consecration of the bread and wine there takes place a change of the whole substance of the bread into the substance of the body of Christ our Lord and of the whole substance of the wine into the substance of his blood. This change the holy Catholic Church has fittingly and properly called transubstantiation." 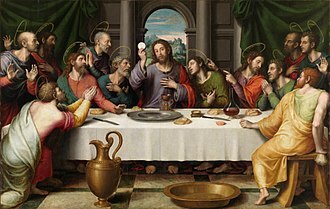 The Catholic Church holds that the same change of the substance of the bread and of the wine at the Last Supper continues to occur at the consecration of the Eucharist:1377 when the words are spoken in persona Christi "This is my body ... this is my blood." 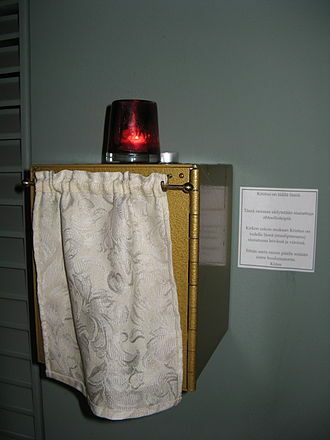 In Orthodox confessions, the change is said to start during the Dominical or Lord's Words or Institution Narrative and be completed during the Epiklesis. 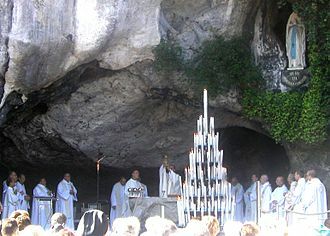 Teaching that Christ is risen from the dead and is alive, the Catholic Church holds, in addition to the doctrine of transubstantiation, that when the bread is changed into his body, not only his body is present, but Christ as a whole is present "the body and blood, together with the soul and divinity") The same holds when the wine is transubstantiated into the blood of Christ. 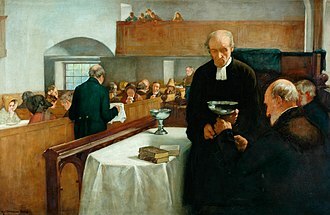 In accordance with the dogmatic teaching that Christ is really, truly and substantially present under the remaining appearances of bread and wine, and continues to be present as long as those appearances remain, the Catholic Church preserves the consecrated elements, generally in a church tabernacle, for administering Holy Communion to the sick and dying, and also for the secondary, but still highly prized, purpose of adoring Christ present in the Eucharist. "denieth, that, in the sacrament of the most holy Eucharist, are contained truly, really, and substantially, the body and blood together with the soul and divinity of our Lord Jesus Christ, and consequently the whole Christ; but saith that He is only therein as in a sign, or in figure, or virtue" and anyone who "saith, that, in the sacred and holy sacrament of the Eucharist, the substance of the bread and wine remains conjointly with the body and blood of our Lord Jesus Christ, and denieth that wonderful and singular conversion of the whole substance of the bread into the Body, and of the whole substance of the wine into the Blood – the species only of the bread and wine remaining – which conversion indeed the Catholic Church most aptly calls Transubstantiation, let him be anathema." The Catholic Church asserts that the consecrated bread and wine are not merely "symbols" of the body and blood of Christ: they are the body and blood of Christ. 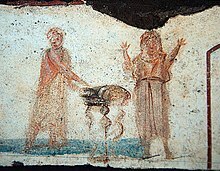 It also declares that, although the bread and wine completely cease to be bread and wine (having become the body and blood of Christ), the appearances (the "species" or look) remain unchanged, and the properties of the appearances also remain (one can be drunk with the appearance of wine despite it only being an appearance). They are still the appearances of bread and wine, not of Christ, and do not inhere in the substance of Christ. They can be felt and tasted as before, and are subject to change and can be destroyed. If the appearance of bread is lost by turning to dust or the appearance of wine is lost by turning to vinegar, Christ is no longer present. By definition sacraments are "efficacious signs of grace, instituted by Christ and entrusted to the Catholic Church, by which divine life is dispensed to us". The essential signs of the Eucharistic sacrament are wheat bread and grape wine, on which the blessing of the Holy Spirit is invoked and the priest pronounces the words of consecration spoken by Jesus during the Last Supper: "This is my body which will be given up for you. ... This is the cup of my blood ..." When the signs cease to exist, so does the sacrament. Ordinary food is consumed and becomes that which consumes it. In the Eucharist, we consume God and become that which we consume. According to Catholic teaching, the whole of Christ, body and blood, soul and divinity, is in the sacrament, under each of the appearances of bread and wine and in each part of the appearances of bread and wine (since the substance of bread or wine is in each part of ordinary bread or wine, and the substance of Christ is in each part of the consecrated and transubstantiated elements of the host and the cup of the sacrament), but he is not in the sacrament as in a place and is not moved when the sacrament is moved. He is perceptible neither by the sense nor by the imagination, but only by the intellectual eye. An official statement from the Anglican–Roman Catholic International Commission titled Eucharistic Doctrine, published in 1971, states that "the word transubstantiation is commonly used in the Roman Catholic Church to indicate that God acting in the Eucharist effects a change in the inner reality of the elements. The term should be seen as affirming the fact of Christ's presence and of the mysterious and radical change which takes places. In Roman Catholic theology it is not understood as explaining how the change takes place." In the smallest particle of the host or the smallest droplet from the chalice Jesus Christ himself is present: "Christ is present whole and entire in each of the species and whole and entire in each of their parts, in such a way that the breaking of the bread does not divide Christ." From the period of the Dominican-Orthodox controversies witnessed by the Fourteenth Century theologian Nicholas Kabasilas until the Council of Florence and the "libellus" (booklet) of Mark of Ephesus, the Orthodox Church took the position of "a double moment of consecration" at the words "This is my body/blood" and the epiclesis (i.e. the part of the Anaphora (Eucharistic Prayer) in which the priest invokes the Holy Spirit (or the power of His blessing) upon the Eucharistic bread and wine). John Torquemada opposed the Orthodox position at the Council of Florence – despite this Orthodox position being a normative interpretation of the De sacramentis and De mysteriis of St. Ambrose. This was all the more ironic since Torquemada cited Paschasius Radbertus (who himself had claimed to quote Augustine) in his Sermo alter in the Acta Latina, in order to refute the Roman Emperor John VIII Palaiologos (who was relying on Mark of Ephesus' "libellus"). The end result was that, though Western theologians from Radbertus until St. Bonaventure of Bagnoregio had held for the consecratory potential of the epiclesis, Torquemada represented the Dominican position as if it was universal and non-controversial among the Latins. In fact, Torquemada's overconfidence was the result of having studied the works of Pope Benedict XII in his debates against Mark of Ephesus at Ferrara in 1437. In these debates, Benedict had condemned an alleged Armenian theory (never verified among any of the dozen or so Armenian commentaries from the period) that denied all consecratory value to the words of institution and confined the consecration ONLY to the epiclesis (which was not the Byzantine position). Lastly, the Armenians were alleged to hold that the eucharistic change was not substantial and only imperfect and typological, and therefore not transubstantiation. The arguments, that Benedict XII's letter to the missionaries (c. 1340) addressed, relied on Aquinas' premises – which was no surprise given Benedict and Pope Clement VI's Thomist preferences. However, the position which he attributed to the Orthodox was confused for the actual Byzantine position expressed from Kabasilas to the Council of Florence. This has led to a gross misunderstanding, still evident also among modern and contemporary scholars when attempting to speak of theological differences between the Catholic Church and the Eastern Orthodox Church. As the Disputation of the Holy Sacrament took place in the Western Church after the Great Schism, the Eastern Churches remained largely unaffected by it. The debate on the nature of "transubstantiation" in Greek Orthodoxy begins in the 17th century, with Cyril Lucaris, whose The Eastern Confession of the Orthodox Faith was published in Latin in 1629. The Greek term metousiosis (μετουσίωσις) is first used as the translation of Latin transubstantiatio in the Greek edition of the work, published in 1633. In the celebration of [the Eucharist] we believe the Lord Jesus Christ to be present. He is not present typically, nor figuratively, nor by superabundant grace, as in the other Mysteries, nor by a bare presence, as some of the Fathers have said concerning Baptism, or by impanation, so that the Divinity of the Word is united to the set forth bread of the Eucharist hypostatically, as the followers of Luther most ignorantly and wretchedly suppose. But [he is present] truly and really, so that after the consecration of the bread and of the wine, the bread is transmuted, transubstantiated, converted and transformed into the true Body Itself of the Lord, Which was born in Bethlehem of the ever-Virgin, was baptized in the Jordan, suffered, was buried, rose again, was received up, sits at the right hand of the God and Father, and is to come again in the clouds of Heaven; and the wine is converted and transubstantiated into the true Blood Itself of the Lord, Which as He hung upon the Cross, was poured out for the life of the world. It should be noted, that the way in which the bread and wine become the body and blood of Christ has never been dogmatically defined by the Eastern Orthodox Churches. However, St Theodore the Studite writes in his treatise On the Holy Icons: "for we confess that the faithful receive the very body and blood of Christ, according to the voice of God himself." This was a refutation of the iconoclasts, who insisted that the eucharist was the only true icon of Christ. Thus, it can be argued that by being part of the dogmatic "horos" against the iconoclast heresy, the teaching on the "real presence" of Christ in the eucharist is indeed a dogma of the Eastern Orthodox Church. Official writings of the churches of the Anglican Communion have consistently affirmed Real Presence of Christ in the Eucharist, a term that includes a belief in the corporeal presence, the sacramental union, as well as several other eucharistic theologies. Elizabeth I, as part of the Elizabethan Religious Settlement, gave royal assent to the Thirty-Nine Articles of Religion, which sought to distinguish Anglican from Roman Church doctrine. The Articles declared that "Transubstantiation (or the change of the substance of Bread and Wine) in the Supper of the Lord, cannot be proved by holy Writ; but is repugnant to the plain words of Scripture, overthroweth the nature of a Sacrament, and hath given occasion to many superstitions." The Elizabethan Settlement accepted the Real Presence of Christ in the Sacrament, but refused to define it, preferring to leave it a mystery. Indeed, for many years it was illegal in Britain to hold public office whilst believing in transubstantiation, as under the Test Act of 1673. Archbishop John Tillotson decried the "real barbarousness of this Sacrament and Rite of our Religion", considering it a great impiety to believe that people who attend Holy Communion "verily eat and drink the natural flesh and blood of Christ. And what can any man do more unworthily towards a Friend? How can he possibly use him more barbarously, than to feast upon his living flesh and blood?" (Discourse against Transubstantiation, London 1684, 35). In the Church of England today, clergy are required to assent that the 39 Articles have borne witness to the Christian faith. The Eucharistic teaching labeled "receptionism", defined by Claude Beauford Moss as "the theory that we receive the Body and Blood of Christ when we receive the bread and wine, but they are not identified with the bread and wine which are not changed", was commonly held by 16th and 17th-century Anglican theologians. It was characteristic of 17th century thought to "insist on the real presence of Christ in the Eucharist, but to profess agnosticism concerning the manner of the presence". It remained "the dominant theological position in the Church of England until the Oxford Movement in the early nineteenth century, with varying degrees of emphasis". It is important to remember that it is "a doctrine of the real presence" but one which "relates the presence primarily to the worthy receiver rather than to the elements of bread and wine". 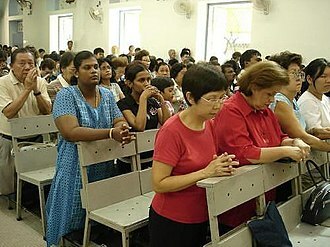 Anglicans generally consider no teaching binding that, according to the Articles, "cannot be found in Holy Scripture or proved thereby", and are not unanimous in the interpretation of such passages as John, Chapter 6, and 1 Corinthians 11, although all Anglicans affirm a view of the real presence of Christ in the Eucharist: some Anglicans (especially Anglo-Catholics and some other High Church Anglicans) hold to a belief in the corporeal presence while Evangelical Anglicans hold to a belief in the pneumatic presence. As with all Anglicans, Anglo-Catholics and other High Church Anglicans historically held belief in the real presence of Christ in the Eucharist but were "hostile to the doctrine of transubstantiation". However, in the first half of the twentieth century, the Catholic Propaganda Society upheld both Article XXVIII and the doctrine of transubstantiation, stating that the 39 Articles specifically condemn a pre-Council of Trent "interpretation which was included by some under the term Transubstantiation" in which "the bread and wine were only left as a delusion of the senses after consecration"; it stated that "this Council propounded its definition after the Articles were written, and so cannot be referred to by them". Theological dialogue with the Roman Catholic Church has produced common documents that speak of "substantial agreement" about the doctrine of the Eucharist: the ARCIC Windsor Statement of 1971, and its 1979 Elucidation. Remaining arguments can be found in the Church of England's pastoral letter: The Eucharist: Sacrament of Unity. Lutherans explicitly reject transubstantiation believing that the bread and wine remain fully bread and fully wine while also being truly the body and blood of Jesus Christ. Lutheran churches instead emphasize the sacramental union (not exactly the consubstantiation, as is often claimed) and believe that within the Eucharistic celebration the body and blood of Jesus Christ are objectively present "in, with, and under the forms" of bread and wine (cf. Book of Concord). 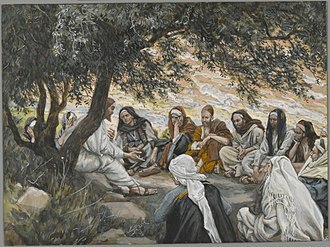 They place great stress on Jesus' instructions to "take and eat", and "take and drink", holding that this is the proper, divinely ordained use of the sacrament, and, while giving it due reverence, scrupulously avoid any actions that might indicate or lead to superstition or unworthy fear of the sacrament. Classical Presbyterianism held Calvin's view of "pneumatic presence" or "spiritual feeding", a real presence by the Spirit for those who have faith. John Calvin "can be regarded as occupying a position roughly midway between" the doctrines of Martin Luther on one hand and Huldrych Zwingli on the other. He taught that "the thing that is signified is effected by its sign", declaring: "Believers ought always to live by this rule: whenever they see symbols appointed by the Lord, to think and be convinced that the truth of the thing signified is surely present there. For why should the Lord put in your hand the symbol of his body, unless it was to assure you that you really participate in it? And if it is true that a visible sign is given to us to seal the gift of an invisible thing, when we have received the symbol of the body, let us rest assured that the body itself is also given to us." He quoted Augustine in his harmony of the Synoptic Gospels on Mark 14:22-25, "Judas ate bread with the Lord, but did not eat the Lord with the bread." Q. What is the Lord's supper? Methodists believe in the real presence of Christ in the bread and wine (or grape juice) while, like Anglicans and Lutherans, rejecting transubstantiation. According to the United Methodist Church, "Jesus Christ, who 'is the reflection of God's glory and the exact imprint of God's very being' (Hebrews 1:3), is truly present in Holy Communion." While upholding the view that scripture is the primary source of Church practice, Methodists also look to church tradition and base their beliefs on the early Church teachings on the Eucharist, that Christ has a real presence in the Lord's Supper. The Catechism for the use of the people called Methodists thus states that, "[in Holy Communion] Jesus Christ is present with his worshipping people and gives himself to them as their Lord and Saviour". ^ Fay, William (2001). "The Real Presence of Jesus Christ in the Sacrament of the Eucharist: Basic Questions and Answers". United States Conference of Catholic Bishops. Retrieved 13 December 2015. the Catholic Church professes that, in the celebration of the Eucharist, bread and wine become the Body and Blood of Jesus Christ through the power of the Holy Ghost and the instrumentality of the priest. ^ Encyclopædia Britannica, "Lateran Council"
^ Hillebrand, Hans J., ed. (2005). "Transubstantiation". The Oxford Encyclopedia of the Reformation. Oxford University Press. ISBN 978-0-19-506493-3. Retrieved 2017-05-30. ^ "Article 3 The Sacrament of the Eucharist". Catechism of the Catholic Church. Holy See. ^ Paul F. Bradshaw, Maxwell E. Johnson, The Eucharistic Liturgies: Their Evolution and Interpretation (Liturgical Press 2012 ISBN 978-0-81466240-3), p. 323. Francis Marsden, "Pope John Paul II's new Document on the Eucharist" (2003). "The Catholic Mass expects God to work a transformation, a change of the elements of bread and wine into the very presence of Christ. The Anglican prayers do not demand this objective change in the elements: they ask merely that the bread and wine should now take on new significance for us, as symbols of His Body and Blood. In fact, the Anglican formulae will bear interpretation either way. This is a deliberate policy, and part of the genius of Anglicanism, its ability to accommodate contradictory doctrines under the same outward form of words." ^ "CATHOLIC ENCYCLOPEDIA: Early Symbols of the Eucharist". Retrieved 2017-05-31. ^ a b "CHURCH FATHERS: Ignatius to the Smyrnaeans". www.earlychristianwritings.com. Retrieved 2017-11-12. ^ a b "CHURCH FATHERS: On the Mysteries (St. Ambrose)". 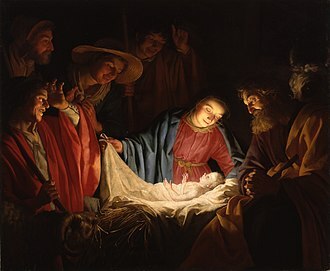 www.newadvent.org. ^ "The Didache". www.earlychristianwritings.com. Retrieved 2017-11-12. ^ "Ignatius to the Romans". www.earlychristianwritings.com. Retrieved 2017-11-12. ^ "Saint Justin Martyr: First Apology (Roberts-Donaldson)". www.earlychristianwritings.com. Retrieved 2017-11-12. ^ "ANF07. Fathers of the Third and Fourth Centuries: Lactantius, Venantius, Asterius, Victorinus, Dionysius, Apostolic Teaching and Constitutions, Homily - Christian Classics Ethereal Library". www.ccel.org. ^ Augustine, On Christian Doctrine, book 4, ch 21, quoting Cyprian. ^ Garry Wills (2000). Papal Sin: Structures of Deceit. ^ Wills, Garry (November 4, 2007). "'Abortion isn't a religious issue'". Los Angeles Times. ^ Wills, Garry (February 15, 2012). "'Contraception's Con Men'". New York Review of Books. ^ Wills, Garry (August 15, 2002). "The Bishops at Bay". New York Review of Books. ^ Wills, Garry. Why Priests? : A Failed Tradition. Penguin Books; Reprint edition (January 28, 2014). p. 16. ISBN 978-0143124399. ^ Wills, Garry. Why Priests? : A Failed Tradition. Penguin Books; Reprint edition (January 28, 2014). pp. 55–56]. ISBN 978-0143124399. ^ Herbermann, Charles, ed. (1913). "Fourth Lateran Council (1215)" . Catholic Encyclopedia. New York: Robert Appleton. . of Faith Fourth Lateran Council: 1215, 1. Confession of Faith, retrieved 2010-03-13. ^ Adams, Marylin (2012). Some later medieval theories of the Eucharist: Thomas Aquinas, Gilles of Rome, Duns Scotus, and William Ockham. Oxford University Press. ISBN 9780199658169. ^ Luther, M. The Babylonian Captivity of the Christian Church. 1520. Quoted in, McGrath, A. 1998. Historical Theology, An Introduction to the History of Christian Thought. Blackwell Publishers: Oxford. p. 198. ^ "A Prelude by Martin Luther on the Babylonian Captivity of the Church, 2:26 & 2:27". Archived from the original on 2009-06-18. ^ "The Literature of Persecution and Intolerance - FindLaw". Findlaw. ^ a b c J. Waterworth (ed.). "The Council of Trent - The Thirteenth Session". Scanned by Hanover College students in 1995 (1848 ed.). London: Dolman. ^ Adams, Italian Renaissance Art, p. 345f. ^ Maisie Ward and F. J. Sheed, Catholic Evidence Training Outlines (Sheed & Ward, third edition 1935), p. 240. ^ a b c "V. The Sacramental Sacrifice Thanksgiving, Memorial, Presence". Catechism of the Catholic Church. Libreria Editrice Vaticana. ^ Kappes, Christiaan. "The Epiclesis Debate: Mark of Ephesus and John Torquemada, OP, at the Council of Florence 1439 (University of Notre Dame Press) at press 2017". ^ Paul J. Glenn, "A Tour of the Summa: The Accidents or Accidentals of the Holy Eucharist"
^ Douglas, Brian (3 September 2015). The Eucharistic Theology of Edward Bouverie Pusey: Sources, Context and Doctrine within the Oxford Movement and Beyond. BRILL. p. 139. ISBN 9789004304598. ^ Catechism of the Catholic Church, 1356-1381, number 1377, cf. Council of Trent: DS 1641: "Nor should it be forgotten that Christ, whole and entire, is contained not only under either species, but also in each particle of either species. 'Each,' says St. Augustine, 'receives Christ the Lord, and He is entire in each portion. He is not diminished by being given to many, but gives Himself whole and entire to each.'" (Quoted in Gratian, p. 3, dist. ii. c. 77; Ambrosian Mass, Preface for Fifth Sunday after Epiph.) The Catechism of the Council of Trent for Parish Priests, issued by order of Pope Pius V, translated into English with Notes by John A. McHugh, O.P., S.T.M., Litt. D., and Charles J. Callan, O.P., S.T.M., Litt. D., (1982) TAN Books and Publishers, Inc., Rockford, Ill. ISBN 978-0-89555-185-6. p. 249 "Christ Whole and Entire Present in Every Part of Each Species". ^ "Epiklesis". Catholic Encyclopedia. Retrieved 2007-02-18. ^ "Creeds of Christendom, with a History and Critical notes. Volume I. The History of Creeds. - Christian Classics Ethereal Library". www.ccel.org. ^ "The Holy Orthodox Church at the Synod of Jerusalem (date 1643 A.D.) used the word metousiosis—a change of ousia—to translate the Latin Transubstantiatio" (Transubstantiation and the Black Rubric). ^ Confession of Dositheus Archived 2009-02-21 at the Wayback Machine (emphasis added) The Greek text is quoted in an online extract from the 1915 book "Μελέται περί των Θείων Μυστηρίων" (Studies on the Divine Mysteries/Sacraments) by Saint Nektarios. ^ Poulson, Christine (1999). The Quest for the Grail: Arthurian Legend in British Art, 1840–1920. Manchester University Press. p. 40. ISBN 9780719055379. By the late 1840s Anglo-Catholic interest in the revival of ritual had given new life to doctrinal debate over the nature of the Eucharist. Initially, 'the Tractarians were concerned only to exalt the importance of the sacrament and did not engage in doctrinal speculation'. Indeed they were generally hostile to the doctrine of transubstantiation. For an orthodox Anglo-Catholic such as Dyce the doctrine of the Real Presence was acceptable, but that of transubstantiation was not. ^ Spurr, Barry (3 April 2010). Anglo-Catholic in Religion. Lutterworth Press. p. 100. ISBN 0718830733. The doctrine had been affirmed by Anglican theologians, through the ages, including Lancelot Andrewes, Jeremy Taylor (who taught the doctrine of the Real Presence at the eucharist, but attacked Roman transubstantiation), William Laud and John Cosin – all in the seventeenth century – as well as in the nineteenth century Tractarians and their successors. ^ a b "Transubstantiation and the Black Rubric". anglicanhistory.org. ^ "Pro Unione Web Site - Full Text ARCIC Eucharist". www.prounione.urbe.it. ^ "Pro Unione Web Site - Full Text ARCIC Elucidation Eucharist". www.prounione.urbe.it. ^ "Council for Christian Unity" (PDF). www.cofe.anglican.org. ^ Luther, Martin (1537), Smalcald Articles, Part III, Article VI. Of the Sacrament of the Altar, stating: "As regards transubstantiation, we care nothing about the sophistical subtlety by which they teach that bread and wine leave or lose their own natural substance, and that there remain only the appearance and color of bread, and not true bread. For it is in perfect agreement with Holy Scriptures that there is, and remains, bread, as Paul himself calls it, 1 Cor. 10:16: The bread which we break. And 1 Cor. 11:28: Let him so eat of that bread." ^ VII. The Lord's Supper: Affirmative Theses, Epitome of the Formula of Concord, 1577, stating that: "We believe, teach, and confess that the body and blood of Christ are received with the bread and wine, not only spiritually by faith, but also orally; yet not in a Capernaitic, but in a supernatural, heavenly mode, because of the sacramental union"
^ "Real Presence Communion – Consubstantiation?". WELS Topical Q&A. Wisconsin Evangelical Lutheran Synod. 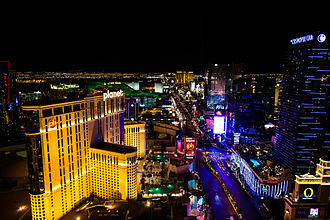 Archived from the original on 27 September 2009. Retrieved 25 July 2016. Although some Lutherans have used the term 'consbstantiation' [sic] and it might possibly be understood correctly (e.g., the bread & wine, body & blood coexist with each other in the Lord's Supper), most Lutherans reject the term because of the false connotation it contains ... either that the body and blood, bread and wine come together to form one substance in the Lord’s Supper or that the body and blood are present in a natural manner like the bread and the wine. Lutherans believe that the bread and the wine are present in a natural manner in the Lord’s Supper and Christ's true body and blood are present in an illocal, supernatural manner. ^ "This Holy Mystery: Part Two". The United Methodist Church GBOD. Archived from the original on July 7, 2009. Retrieved 30 May 2013. ^ A Catechism for the use of people called Methodists. Peterborough, England: Methodist Publishing House. 2000. p. 26. ISBN 9781858521824. Burckhardt Neunheuser, "Transsubstantiation." Lexikon für Theologie und Kirche, vol. 10, cols. 311-14. Miri Rubin, Corpus Christi: The Eucharist in Late Medieval Culture (1991), pp. 369–419. Richard J. Utz and Christine Batz, "Transubstantiation in Medieval and Early Modern Culture and Literature: An Introductory Bibliography of Critical Studies," in: Translation, Transformation, and Transubstantiation, ed. Carol Poster and Richard Utz (Evanston: IL: Northwestern University Press, 1998), pp. 223–56." In Catholicism, where the host is held to have been transubstantiated into the body of Jesus Christ, host desecration is among the gravest of sins. Intentional host desecration is not only a sin but incurs the penalty of excommunication latae sententiae. Throughout history, a number of groups have been accused of desecrating the Eucharist, accusations against Jews were a common pretext for massacres and expulsions throughout the Middle Ages in Europe. Similar accusations were made in witchcraft trials, witch-hunters guides such as the Malleus Maleficarum refer to hosts as being objects of desecration by witches and it is part of many descriptions of the Black Mass, both in ostensibly historical works and in fiction. During the Middle Ages, Roman Catholic theology offered the concept of transubstantiation to explain this change of substance which was believed to be actual and not merely symbolic. The concept, defined as a dogma at the Fourth Lateran Council of 1215, holds that the substances of the offerings are literally transformed, while the appearance of bread, many Christians believe Jesus to be true God and true man. In the Catholic Church, his body, blood and they are at the same time body and blood and wine. in this sacrament the Lutheran Christian receives the very body and blood of Christ precisely for the strengthening of the union of faith. The Methodist Church similarly holds that Christ is truly present in the Eucharist through the elements of bread and wine, Host desecration has been associated with groups identified as inimical to Christianity. It is a belief that desecration of the host is part of Satanic practice. LaVeyan Satanists do not typically perform Black Mass as a regular ritual, communion in the hand is now widespread in many parts of the world. The practice means that access to consecrated Hosts is easier than in the past, recent statements and practices of Pope Benedict XVI have caused a recent shift in Catholic practice of receiving on the tongue while kneeling, which is an ancient practice. Accusations of host desecration leveled against Jews were a pretext for massacres. The libel of Jewish deicide, that the Jewish people were responsible for the killing of Jesus and it was spuriously claimed that Jews stole hosts, and further spuriously claimed that they abused these hosts to re-enact the crucifixion of Jesus by stabbing or burning them. A paten, or diskos, is a small plate, usually made of silver or gold, used to hold Eucharistic bread which is to be consecrated. It is generally used during the service itself, while the reserved sacrament are stored in the tabernacle in a ciborium, in many Western liturgical denominations, the paten is typically either a simple saucer-like plate or a low bowl. A smaller style paten will often have a depression that allows it to sit on top of the chalice. The General Instruction of the Roman Missal lays down rules for patens, if they are made from metal that rusts or from a metal less precious than gold, they should generally be gilded on the inside. Patens are used among Anglicans and Lutherans, in the Byzantine Rite Orthodox and Byzantine Rite Catholic Churches, the paten is called a diskos and is elevated by a stand permanently attached underneath. The diskos is usually more ornate than its Latin Rite counterpart, the diskos may be engraved with an icon of Jesus Christ, the Nativity of Christ, the Cross, or most frequently the Theotokos. When a diskos is made, it is accompanied by a matching asterisk, a spoon. During the Divine Liturgy it is not only the Lamb that is placed on the diskos, but particles to commemorate the Theotokos, the Saints, the living and the departed. Thus, on the diskos is represented the entire Church, the Church Militant, at the Great Entrance the deacon carries the Diskos, holding the foot of the diskos at his forehead. He kneels at the side of the Holy Table, during the Anaphora, only the Lamb is consecrated. After Communion, the Deacon holds the diskos above the holy chalice and recites hymns of the Resurrection. Then he wipes the remaining particles into the saying the words, Wash away, O Lord. During the Consecration of a Church, a diskos is used to hold the relics of the saints which will be sealed in the Holy Table and antimension by the bishop. When a priest is ordained, a portion of the Lamb will be placed on a small diskos and given to him, in the Russian tradition, there is a special service of blessing used to sanctify a diskos before its first use at Liturgy. 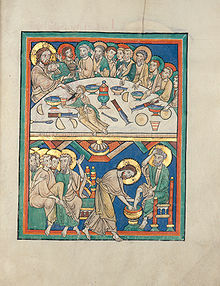 The Eucharist in the Lutheran Church refers to the liturgical commemoration of the Last Supper. Martin Luther saw the main basis for the Eucharist to be found in Matthew 26, 26–28, Mark 14, 22–24, Luke 22, 19-20, the Lutheran doctrine of the Real Presence is known as the sacramental union. This theology was first formally and publicly confessed in the Wittenberg Concord and it has been called consubstantiation but most Lutheran theologians reject the use of this term as it creates confusion with an earlier doctrine of the same name. Some Lutherans do believe in consubstantiation, for Lutherans the Eucharist is not considered to be a valid sacrament unless the elements are used according to Christs mandate and institution. This was first formulated in the Wittenberg Concord of 1536 in the formula, to remove any scruple of doubt or superstition, the reliquiæ traditionally are either consumed, poured into the earth, or reserved. Today, many Lutheran churches offer the Eucharist weekly, while others offer it less often and funerals sometimes include the celebration of the Eucharist in Lutheran churches. At the ordinations of pastors/priests and the consecration of bishops, the Eucharist is always offered, for Lutherans in general and absolution are considered proper preparation for receiving the sacrament. However, the practice among Lutherans of preparation by private confession and absolution is rarely found in American Lutheran congregations. 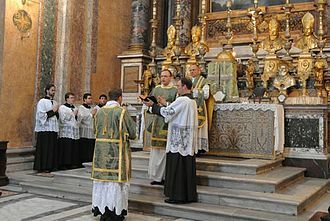 For this reason, often an order or corporate rite of confession and absolution is included at the beginning of Lutheran liturgies. Most other ELCA congregations offer First Communion instruction to children in the 5th grade, in other Lutheran churches, the person must have receive confirmation before receiving the Eucharist. Infants and children who havent received the instruction may be brought to the Eucharistic distribution by their parents to be blessed by the pastor. The manner of receiving the Eucharist differs throughout the world, the congregation departs and may make the sign of the cross. 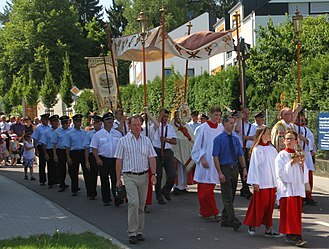 In other Lutheran churches, the process is much like the Post-Vatican II revised rite of the Roman Catholic Church, the eucharistic minister and his assistants line up, with the eucharistic minister in the center holding the hosts and the two assistants on either side holding the chalices. Sacramental bread, sometimes called altar bread, Communion bread, the Lamb or simply the host, is the bread which is used in the Christian ritual of the Eucharist. The word hostia is Latin for sacrificial animal, the sacrifice of Jesus according to Christian theology puts an end to the need for animal sacrifice as had been practiced in the Jerusalem Temple and all blood sacrifice once-for-all. The word was retained to describe the bread of Eucharist as a representation of the Christs sacrifice. The Orthodox Church and Eastern-rite Roman Catholic churches use leavened bread for the Eucharist, the sacramental bread symbolizes the Resurrected Christ. The hostia or sacramental bread, known as prosphorá or a πρόσφορον may be out of only four ingredients, fine wheat flour, pure water, yeast. Sometimes holy water will be sprinkled into the dough or on the kneading trough at the beginning of the process. The baking may only be performed by a believing Orthodox Christian in good standing—having preferably been recently to Confession, before baking, each loaf is formed by placing two disks of dough, one on top of the other, and stamping it with a special liturgical seal. The prosphora should be fresh and not stale or moldy when presented at the altar for use in the Divine Liturgy, often several prosphora will be baked and offered by the faithful, and the priest chooses the best one for the Lamb that will be consecrated. The remaining loaves are blessed and offered back to the congregation after the end of the Divine Liturgy, a Hostia is a portion of bread used for Holy Communion in many Christian churches. In Western Christianity the host is often a thin, round unleavened wafer, the word host is derived from the Latin hostia, which means sacrificial victim. The term can be used to describe the bread both before and after consecration, though it is correct to use it after consecration—altar bread being preferred before consecration. Western theology teaches that at the Words of Institution the bread is changed or altered into the Body of Christ, hosts are often made by nuns as a means of supporting their religious communities. In the Latin Rite, unleavened bread is used as in the Jewish Passover or Feast of Unleavened Bread, the Byzantine Rite Eastern Catholic Churches use leavened bread for Prosphora. A chalice is a goblet or footed cup intended to hold a drink. In general religious terms, it is intended for drinking during a ceremony, chalices are often made of precious metal, and they are sometimes richly enamelled and jewelled. The gold goblet was symbolic for family and tradition, the ancient Roman calix was a drinking vessel consisting of a bowl fixed atop a stand, and was in common use at banquets. Chalices have been used since the early church, because of Jesus command to his disciples to Do this in remembrance of me. And Pauls account of the Eucharistic rite in 1 Corinthians 11, 24-25, the vessels used in this important act of worship were highly decorated and treated with great respect. A number of examples of chalices have a large bowl. Over time, the size of the bowl diminished and the base became larger for better stability, over time, official church regulations dictated the construction and treatment of chalices. Some religious traditions still require that the chalice, at least on the inside of the cup, in Western Christianity, chalices will often have a pommel or node where the stem meets the cup to make the elevation easier. In Roman Catholicism, chalices tend to be tulip-shaped, and the cups are quite narrow, Roman Catholic priests will often receive chalices from members of their families when first ordained. In Eastern Christianity, chalices will often have icons enameled or engraved on them, in Orthodoxy and Eastern Catholicism, all communicants receive both the Body of Christ and the Blood of Christ. To accomplish this, a portion of the Lamb is placed in the chalice, for this reason, eastern chalices tend to have larger, rounded cups. In the Russian Orthodox Church, the faithful will kiss the foot of the chalice after receiving Holy Communion. In other traditions, they kiss the cup. Although Orthodox monks are not permitted to hold personal possessions, the permit a hieromonk to keep a chalice. In the early and medieval church, when a deacon was ordained, early written accounts of the ordination of deaconesses reflect this practice. In the West the deacon carries the chalice to the altar at the offertory, in the East, the priest carries the chalice and the deacon carries the paten. In Protestant sacramental theology, sacramental union is the relationship between the outward substance or sign of a sacrament and the thing signified by the sacrament. Lutherans believe the sign and thing signified to be locally united, Reformed Christians believe the sign and thing signified to be inseparable, but to be united spiritually rather than locally and bodily. Lutherans maintain that what they believe to be the doctrine of the manducatio indignorum supports this doctrine as well as any other doctrine affirming the Real Presence. The manducatio indignorum is the contention that even unbelievers eating and drinking in the Eucharist really eat and drink the body and blood of Christ. Here, out of two kinds of objects a union has taken place, which I shall call a sacramental union, because Christ’s body and this is not a natural or personal union, as is the case with God and Christ. It is perhaps a different union from that which the dove has with the Holy Spirit, and the flame with the angel and it is asserted in the Wittenberg Concord of 1536 and in the Formula of Concord. The Formula of Concord couples the term with the circumlocution used among Lutherans to further define their view, For the reason why, in addition to the expressions of Christ and St. The term consubstantiation has been associated with such a local inclusion of the Body and Blood of Christ in the sacramental bread, Martin Luther distinguished this doctrine from that of transubstantiation and impanation in this way. We do not make Christs body out of the bread, nor do we say that his body comes into existence out of the bread. We say that his body, which long ago was made and came into existence, is present when we say, for Christ commands us to say not, Let this become my body, or, Make my body there, This is my body. The Lutheran doctrine of the union is distinct from the Reformed view. The Calvinistic view of Christs presence in the Lords Supper is that Christ is truly present at the meal and this is in line with their general belief that the finite is not capacious for the infinite. Lutherans, on the hand, describe the Personal Union of the two natures in Christ as sharing their predicates or attributes more fully. Viaticum is a term used especially in the Catholic Church for the Eucharist administered, with or without anointing of the sick, to a person who is dying, and is thus a part of the last rites. According to Cardinal Javier Lozano Barragán, The Catholic tradition of giving the Eucharist to the dying ensures that instead of dying alone they die with Christ who promises them eternal life. For Communion as Viaticum, the Eucharist is given in the form, with the added words May the Lord Jesus Christ protect you. The word viaticum is a Latin word meaning provision for a journey, from via, or way. The Eucharist is seen as the spiritual food to strengthen a dying person for the journey from this world to life after death. ”If the dying person cannot take solid food. The sacrament of Anointing of the Sick is often administered immediately before giving Viaticum if a priest is available to do so, unlike the Anointing of the Sick, Viaticum may be administered by a priest, deacon or by an extraordinary minister, using the reserved Blessed Sacrament. 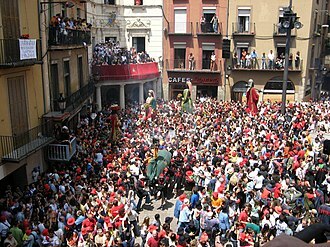 Preparation shown for the celebration of the Eucharist. 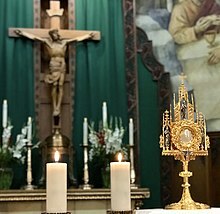 Catholics give adoration to Christ, whom they believe to be really present, in body and blood, soul and divinity, in sacramental bread whose reality has been changed into that of his body. 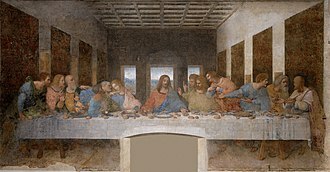 The Last Supper by Leonardo da Vinci Christ administered "the fruit of the vine". Ancient wine press in Israel with the pressing area in the center and the collection vat off to the bottom left. Celebration of the Holy Eucharist in a parish of the Lutheran Church–Missouri Synod, with communicants kneeling at the chancel rails to receive the body of Christ. Man of Sorrows from Prague, around 1470. Jesus Christ is taking out a host from his wound while his blood is flowing down into a chalice. The depiction of Christ, symbolically offering his body and blood, clearly demonstrates the practice of receiving the Communion under both kinds, which was crucial for the Bohemian Reformation of the 15th century. A sailor receives Communion from a Catholic chaplain aboard a US Navy ship. Elisabeth of Brandenburg secretly takes communion in both kinds. 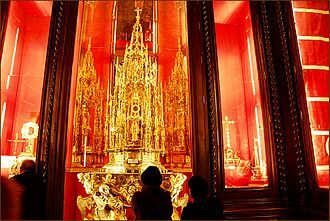 Russian Orthodox vessel for taking Holy Communion to the sick (Kiev-Pecherski Lavra), kept in a tabernacle on the Holy Table (altar). The Guibourg Mass by Henry de Malvost, in the book Le Satanisme et la magie by Jules Bois, Paris, 1903. Sixteenth century woodcut depicting black mass. Engraving from a 1797 edition of Justine, by the Marquis de Sade. St. John Chrysostom: "When we have received the precious Body of Jesus Christ, we should take care not to lose its heavenly flavor by turning too soon to the cares and business of the world." Martin Luther celebrating the Divine Service (predella of the 1547 altar by Lucas Cranach the Elder and Younger in St. Mary's Church, Wittenberg, Germany).